How to calculate the equivalent resistance value for resistors in series? In many electrical circuits resistors are connected in series or parallel. A designer might for example combine several resistors with standard values (E-series) to reach a specific resistance value. For series connection, the current through each resistor is equal. There is only one path for the current to follow. The voltage drop however, is proportional to the resistance of each individual resistor. The equivalent resistance of several resistors in series is given by: The voltage across each resistor is calculated with Ohm’s law: Example Consider a circuit as shown in the picture below. 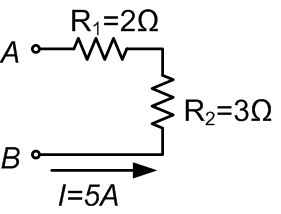 Two resistors R1 and R2 connected in series are subject to a constant current I. How can we calculate the voltage drop for each resistor and how can we determine the equivalent resistance value for the two resistors? The current through each resistor is equal. Knowing this, and using Ohm’s law we get the voltage drop for R1 and R2: The equivalent resistance is equal to the sum of R1 and R2: This corresponds with the voltage drops that we calculated: Networks with resistors in parallel and series Take a look at the article resistors in parallel to find practical examples of how to solve a resistor network with resistors that are connected in series and parallel. 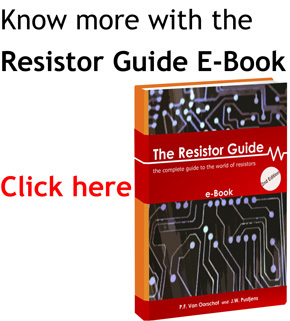 The following video might help to get a quick understanding in solving resistor networks.